The first Kenworth is a new T880S Twin Steer mixer, which is equipped with a 14-yard London mixer body. 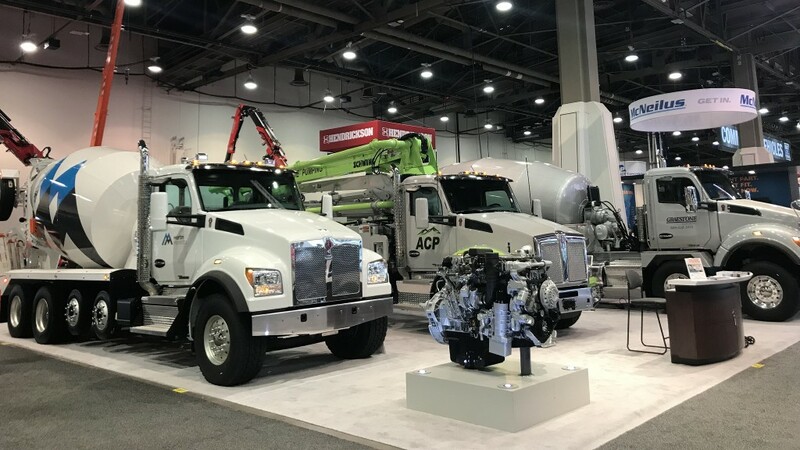 The truck is specified with a PACCAR MX-13 engine rated at 455 hp and 1,650 ft-lb of torque, Allison 4700RDS 7-speed automatic transmission, set-forward dual PACCAR 20,000-pound front axles, and 46,000-pound Meritor tandem rear axles. The T880S Twin Steer will be delivered to Graestone Ready Mix in Langley, British Columbia. The second Kenworth T880S mixer is equipped with an 11-yard Con-Tech BridgeKing mixer body. The T880S has a PACCAR MX-11 engine rated at 400 hp and 1,450 ft.-lb. of torque, Eaton UltraShift Plus VMS transmission, set-forward Dana Spicer D2000 20,000-pound front axle, and Meritor 46,000-pound tandem rear axles. This T880S mixer will go to Martin Marietta in Dallas, Texas. The Kenworth T880 Schwing pumper in Kenworth's booth features a S36X 36-meter, truck-mounted concrete pump. The T880 has an Allison 4500RDS 6-speed automatic transmission, Meritor 20,000-pound set-back front axle and Meritor 46,000-pound tandem rear axles. The T880 pumper will be placed into service by Altitude Pumping in Loveland, Colorado. "Truck operators can depend on the Kenworth T880 and T880S to get the job done in their specific vocational applications. The vocational flagship Kenworth T880 series offers low operating cost, excellent performance and productivity, and outstanding driver comfort," said Kurt Swihart, Kenworth marketing director.